Both posts discuss the merits of building a relationship with an online donor through offline communications - e.g., should you receive a thank-you letter in the mail or simply via email, since the donor has shown their preference for online communications? And the discussion also touched on whether the preference for online versus offline communication is based on age - e.g., older donors might prefer mail instead of email. So - is it the message, the medium or both? But it seems to me, it’s not just about the medium it’s also about the message. Now I have to admit I’m not a fundraiser - my fundraising experience is limited to developing an awareness campaign for a national charity (no stewardship or development experience). But I would think that a donor would want and even expect, more than just an automatic email acknowledging their donation. I know as a donor, I want to receive a thank-you letter too. In discussing this with my colleagues, we realized that the same message content can have a very different impact depending on how it is delivered - so I guess it's about the message and the medium. To find out first hand what donors want, I decided to watch a couple of Movie Monday videos in which they interviewed and got candid feedback from actual donors. All three of the donors said they couldn’t emphasize enough that the thank you’s that touched them most were the simple personal call or a personal note of thanks. They also appreciated a personal follow-up with information on the impact their donation had made. don’t like phone calls - unless they know the person (again it has to be personal - of course) and it often sounds like they are reading from a script. When discussing the type of information they want to see, one of the donors replied: “Does it tell me what they’re doing? Does it tell me why it is important and why I should care? Does it give me an easy way to get engaged? And as I was about to publish this, I saw another post - Speechless - on the Agents of Good blog. In the post, John Lepp tells us about a "Simple. Remarkable. Memorable. 35 seconds" phone call saying thanks from the president of the board of an organization he'd made a donation to that very day. Lepp says "... I listened for 35 seconds and I felt a massive smile spread across my face and instantly knew at the close of her call that I had ABSOLUTELY made an awesome decision to give earlier in the day. Unscripted, honest, heartfelt and real and 15 minutes before the start of a long weekend… her call touched my heart." So it seems that if donors, fundraising and communications experts are all telling us that saying thank you - both online and off - in a personal way is both powerful and expected, nonprofits and charities should give donors what they want! Acknowledge their online or offline donation via email, but be sure to send along a note or thank-you letter, or make a heartfelt thank-you call - one that is both personal and prompt! 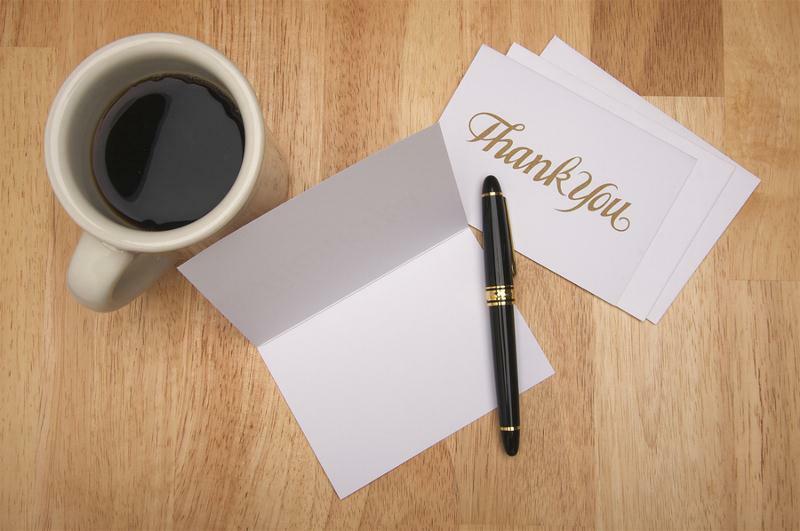 Are you sending thank-you notes or cards in the mail to your online donors? Let us know in the comments below. Thanks for question and info. Yes, we mail traditional thank you letters to online donors, when we have their info. I also try to add a personal sentence or 2, regarding how the donation will help. Mary: Glad you liked the post and also good to hear that you are offering personalized thank-you's to donors. Thanks so much, Lori, for mentioning my blog post about mailing thank you letters...even to online donors. I think we'll be discussing this for a long time. Maybe, someday, we'll be able to do with just email thank yous. But for now, that tangible something is still important. But to make it to my bulletin board or fridge, it needs to be very personalized, warm, and unique in some way. Also, we all give online and often promptly forget about it. A mailed thank you that arrives quickly does much to remind us of what we did and to stick that cause in our minds. Joanne: Glad to include your post. I agree, that even when we give online for convenience, the thank-you in the mail, especially the prompt and personal one, definitely reconnects us with the cause and gives us a tangible reminder of our gift.